Seems like not just the fans, even celebs cannot get enough of Fawad Khan! Deepika is a true Fawad Khan fan and is set on casting Fawad Khan for Sanjay Leela Bhansali’s upcoming Bollywood venture, ‘Padmavati’. The duo set the ramp on fire at the Delhi Couture Week 2016 walking for Manish Malhotra. The Khoosurat star went down on one knee for the sultry actress at the IIFA Awards 2016 and now the actress cannot stop gushing over him. Media was buzzing with news of Fawad Khan starring as Deepika’s husband in Sanjay Leela Bhansali’s next movie Padmavati; however, it was reported by the Indian entertainment portal Pinkvilla that Fawad Khan will NOT be playing Deepika’s husband in the movie. While reports regarding Deepika’s Padmavati co-stars are making rounds, it seems like the Bollywood beauty is set on starring opposite Fawad. “As of now, Deepika is the only one who is confirmed for the film. She has told Mr. Bhansali that Fawad is the perfect fit for both the male characters in the film,” quoted a source close to Sanjay Leela Bhansali, reported Pinkvilla. The two have been getting pretty close, especially after their secret getaway to Barcelona, alongside Karan Johar. She even attended Fawad’s wrap up party for upcoming movie Ae Dil Hai Mushkil, also starring Ranbir Kapoor, Aishwarya Rai, and Anushka Sharma. “They connected like two professionals and talked movies, actor’s craft and their other interests. 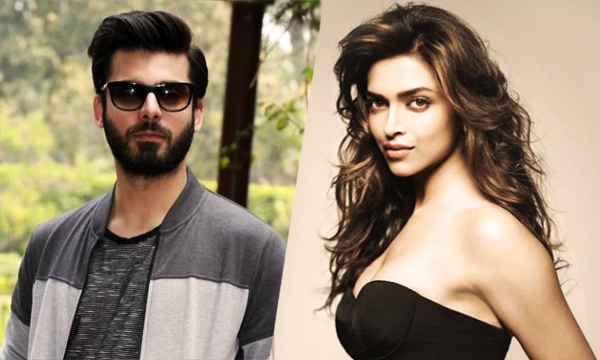 There was no mistaking that Deepika was very impressed with Fawad,” reported Pinkvilla. “Fawad is extremely busy with other projects in Pakistan. Also, he has signed a three-film deal with Karan Johar’s Dharma Productions. So obviously the actor cannot break this and work with any other director. So there is no chance of him signing Bhansali’s Padmavatiemphasized text,” Pinkvilla had reported earlier. The movie is made on the life of Rani of Chittor played by Deepika Padukone. She has an obsessive and passionate lover Alauddin Khilji played by Ranveer Singh. The role of Rani’s husband that was offered to Fawad Khan is of a less smart man and that role is causing a lot of problems in casting. Actors like Hrithik Roshan, Shah Rukh Khan, and Shahid Kapoor have been approached for the role before but they all rejected it. We just cannot wait for the sultry couple sizzle on screen together.